The ancient city of Troy, which is the place where Homer lived in the Iliad Epic, is a must-see place on Canakkale. The ancient city at the foot of the Kaz Mountain entered the UNESCO World Heritage List as the Ancient City of Troy in 1998. 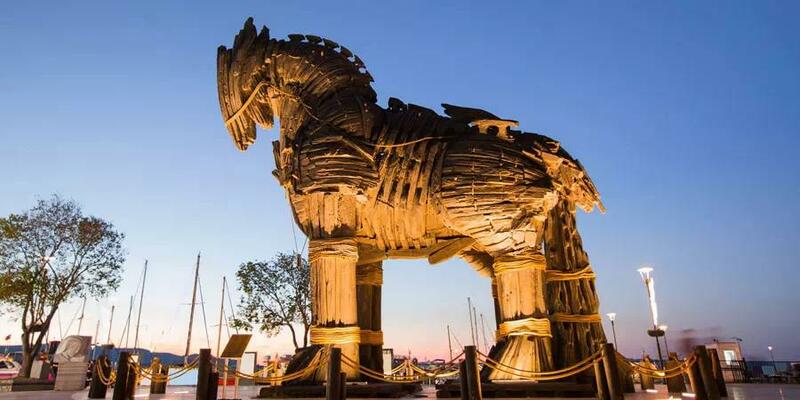 The city of Troy (Troia), which has a history of thousands of years, is the place where the legend of the Trojan Horse, which has been published in many literary works and cinema films. The city of Troy, which is on the trade route between Europe and Anatolia, has faced many natural disasters and wars throughout history. The city, which was destroyed and rebuilt 9 times in total, carries the traces of these different structures. Troy is the name of the Bronze Age city featured in the Trojan War of ancient Greek oral and literary tradition and the name given to the archaeological site in the north west of Asia Minor (now Turkey) which has revealed a large and prosperous city occupied over millennia. There has been much scholarly debate as to whether mythical Troy actually existed and if so whether the archaeological site was the same city; however, it is now almost universally accepted that the archaeological excavations have revealed the city of Homer’s Iliad. Other names for Troy include Hisarlik (Turkish), Ilios (Homer), Ilion (Greek) and Ilium (Roman). The ancient name is Kala-i Sultaniye. Cimenlik Castle, which now serves as a military museum, was built by Fatih Sultan Mehmet in 1462. In addition to the existent collection of artillery in Çimenlik Fortress, materials, donated from willing people and private foundations, were gathered and used to enrich this collection. During this enterprise, a team of volunteers also searched the battlefield. Furthermore, archives and inventory lists were thoroughly researched. This building dating from 1927 was converted to a museum in Çimenlik Fortress. The other building dating from 1954 was converted to be a museum management office. Finally, the construction of the museum was completed when the 1/1 ratio replica of the Nusret Mine Layer, the hero of 18th March 1915 Naval Victory, was placed on the platform that was specially designed in the park. The replica was built by Istanbul Shipyard Command. As a result of all this effort, the museum began to provide service with the name “Çanakkale Strait Command Museum” on 18th March 1982. The museum continued its activities held by a civil servant under the control of Central Command. Since then, the name of the museum was changed as Military Museum Management and the first personnel having a rank was appointed. The exhibition arrangement of the museum was renewed under the directions of Naval Force Command in 1995 and till 1999 this arrangement went on. As a necessity of modern museums, the contemporary concept of museology was started to be practiced without disarranging the already existent exhibitions in 1999. Within the scope of this project, interactive presentation has been provided for visitors. Almost 3000 years ago, the Trojans and Greeks fought a long and terrible war. Why? Because the Trojans had captured a beautiful Greek princess Helen. But this is a story about a horse and not the princess. The Greeks fought a battle with Troy but could not get in the tall strong walls around the city. They tried everything but it began to look that Greeks would not win the battle. So the Greeks thought that if they could not win the battle with their physical strength then they should win it with their brains. They thought of a smart trick. They started building a wooden horse. The Trojans kept wondering why the Greeks were building a horse. Some laughed and some were puzzled. Then one day when they saw the greek armies sailing away, they got confused. Soon in few days, all the warships, army tents and armies disappeared. The only thing that remained were the 80 ft tall strange wooden horse. Some Trojan wanted to burn the horse but the King was too proud of defeating Greeks and ordered to bring the horse inside the city walls as a symbol of their victory. After pulling the horse inside they partied and danced all night. Then they went to sleep.It was now that the Greeks played the rest of their trick. Not all the Greeks had sailed away on the warships. A very brave Greek soldier named Odysseus had chosen some tough fighting men to hide inside the hollow wooden horse. Around thirty soldiers stepped out in the dark and signaled their warships that had been hiding around a nearby island. Then they opened the Trojan city gates and the Greek army swarmed in. The Greeks caught the Trojans completely off guard. After a fierce battle they took princess Helen back to Greece. This battleground is small and confined compared to those in Europe. It is possible to see most of the sights in a day or less. The whole area is a National Park so it is relatively well preserved. There are primitive walking tracks over most of the area.Once one leaves the area next to the bitumen pavement the area is in much the same condition as the Anzacs left it. It is possible to see the eroded remains of the old trench lines, filled with scrubby growth. We found shrapnel balls as we were walking around. One also has to keep an eye out for snakes when walking through the scrub. Some of them are apparently quite aggressive. This area is very popular for Turkish tourists remembering their victory in the Battle of Canakkale (Gallipoli) and their national hero Kemal Ataturk. However, they seem to keep next to the road and their monuments along the 3rd ridge. There is a Turkish monument. A short distance further up the road, you turn left onto a unpaved road to the eleventh stopping point, The Nek Cemetery. Turning down the track towards the coast will bring you to Walker’s Ridge Cemetery. Winding westwards further along the track you reach the end of the ridge, overlooking North Beach to the south-west, where your walk began. The Gallipoli Campaign also known as the Dardanelles Campaign was a First World War campaign that took place on the Gallipoli Peninsula in the Ottoman Empire between 25 April 1915 and 9 January 1916. The Peninsula forms the northern bank of the Dardanelles, astrait that provides a sea route to what was then the Russian Empire, one of the Allied powers during the war. Intending to secure it, Russia’s allies Britain and France launched a naval attack followed by an amphibious landing on the Peninsula with the eventual aim of capturing the Ottoman capital of İstanbul. The naval attack was repelled and, after eight months fighting, with many casualties on both sides, the land campaign also failed and the invasion force was withdrawn to Egypt. Gallipoli Peninsula National Historical Park established in 1973 and included in the UN List of Natioanl Parks and Protected Areas, covers 33.000 hectares (330 km2) at the southern end of the Gallipoli Peninsula on the European side of the Dardanelles. The Peninsula, a thin (5 km wide at its narrowest) and 80 km long finger of land, juts into the northwest Aegean Sea to form the southeastern extremity of the European continent. It is surrounded on the northwest by the Golf of Saros, one of the least polluted corners of the Aegean Sea, and the east by the Dardanelles, a 70 km natural channel connecting the Aegean Sea and Sea of Marmara. The Gallipoli Peninsula, with its unique geographic setting enriched by a beautiful coast line, ondulating terrain and diverse scenery, reveals interaction and continuity between different cultural zones and displays non-interrupted settlement from the Neolithic Age on. The dramatic history of the area suggests the “bridge and barrier” predicament of the Peninsula. A bridge-head and a meeting place for different cultures over the centuries, the Peninsula also barred or deterred those in pursuit of territorial expansion. Controlling the Dardanelles, an inevitable channel connecting major inner-seas, it witnessed dense maritime trade flows and took its share. By the same token, it always remained a major concern of military strategy and a site of wars across the ages. Included in the Park are the sites of famous First World War Dardanelles naval and Gallipoli Peninsula land battles. The Park holds an extensive range of sunken ships, guns, trenches, forts, bastions and a myriad of other war related artefacts together with Turkish, Australian, New Zealand, English and French war graves and memorials. The battlefields, war graves, monuments, and war related artefacts are registered as “historical sites and objects”. They should be conserved and their integrity must be retained.